Alexander McQueen might be known to you as a fashion designer. Quintessentially he is exactly that, yet it you zero in closer into his work, it becomes an intricate fabric of concepts, expertly drafted plots and storyboards that culminate in a story that his emissions tell. Viewed from this angle, McQueen’s oeuvre has qualities of cinematic proportions informed by his idiosyncratic worldview full of drama and extremes. The book succeeds in documenting the career and work of a man who set out to incorporate and pay references to the past and tradition, challenge the status quo of what was perceived possible and acceptable and pave the way to future with innovations – expression through fashion. Ever the champion of spontaneity, freedom of expression, creativity yet never losing precision out of sight, the romantic and Victorian gothic eras and their signature styles are omnipresent and form the red thread that is weaves through McQueen’s career. 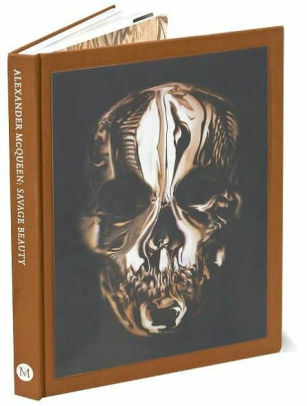 What the book revealed to me as a novum, is that McQueen is also heavily inspired by his Scottish heritage to which some of his collections can be understood to be more than merely homage. What makes it interesting is the balance he strikes – paying respect yet being tongue in cheek and throwing bringing irony in for good measure. Another country that has had massive impact on his approach to tailoring is Japan, which is becomes blatantly evident as you peruse the pieces, which often juxtapose traditional features from different countries to achieve the desired effect. While some of his works is intricately ornate, primitivism plays a major role in his approach as well as the principles of technology and mechanism that underpin the workings of nature - seemingly contradictory lanes that form a mélange that make his work what it is renowned for and vital to spawn the yarn he spins for his narrative. The book comes with a cover feature that the attached depiction won’t be able to do justice in the slightest and will only unfold its savage beauty if you hold it in your hands and play with it.